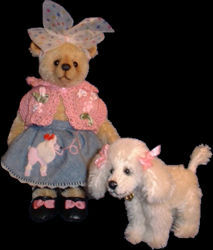 Little Diane is 6" mohair bear , was made specially for my best friend Diane (California,USA) , my friend has a lovely poodle called "Angel" , she's in real life black colour, I made the poodle white to see the details more in this tiny creation..."Little Diane & Poodle) are now living happily in USA..
Yan Yan is a lovely little panda , he's just 3 3/8" tall , he was made for a special lady customer in Mexico,... by clicking on his pic. , you can see more pictures of him .. thanks! this bear was donated for a good cause..
- click on her image to see a group of pictures of her, thanks.